The who’s who of transportation throughout California will gather to honor members of the California Transportation Commission. Join directors and executives from local transportation authorities at two upcoming receptions. Get your business noticed by key clients and teaming partners by sponsoring one or both receptions. Sponsorships are available for $500 for either reception. Sign up to sponsor both receptions and we’ll give you a $50 discount! Sponsorships include: Logo on all pre-event marketing materials and dedicated event web registration page, logo on event signage at event, sponsors will be listed in a future e-news article about events and acknowledged from the podium during the reception. Join us for the largest one-day transportation conference in the state. It’s the only place where you can mix and mingle with every transportation CEO in Southern California, policy makers, leading academicians and nationally-known transportation experts. It’s the best investment for your transportation marketing dollar. Sponsorships are now open to last year’s sponsors and will be available to the general public in March. Join more than 800 transportation practitioners from around the nation who are passionate about creating livable communities at Mobility 21’s reception during the annual Rail~Volution conference. Click here to view the sponsorship packages. Interested? Contact Marnie O’Brien Primmer atmprimmer@mobility21.com or 949.288.6884 for more details. Federal legislation to replace the existing expired transportation bill is moving quickly as the House Transportation and Infrastructure Committee marked up its $260 billion transportation bill last week. The House bill, called the American Energy and Infrastructure Jobs Act, funds transportation over the next five years, consolidates existing programs, provides greater flexibility to transportation planners and cuts federal red tape blocking projects from breaking ground. The Senate Banking Committee’s two-year transit funding bill was also approved last week for incorporation in the Senate bill. Late last year, the Senate Environment and Public Works Committee unanimously approved Moving Ahead for Progress in the 21st Century, a two-year, $109 billion surface transportation bill. Mobility 21 is carefully reviewing the newly-released bill and its fiscal impacts on regions like Southern California. As expected, the House and Senate have significantly different views on structuring our nation’s transportation programs, and how the programs should be funded. Each bill contains provisions of the Breaking Down Barriers and America Fast Forward initiatives, both bills expand the Transportation Infrastructure Finance and Innovation Act (TIFIA) loan program and both bills give freight movement its rightful place in a national surface transportation bill — legislative reforms Mobility 21 has been pushing for the past 18 months. However, the bills differ in how prominently freight features, where funding should come from, and how quickly a freight program should be implemented. There will also be real battles over more controversial aspects of the legislation including the duration of the bill, transit and active transportation provisions (or lack thereof), positive train control, and program consolidation. Now that both bills have been released, the next steps will be to identify funding for the final form of the bill, and to unify both pieces of legislation into one bill that can be passed by both houses and signed by the president. No easy task in these partisan times. Mobility 21 leaders will be meeting with legislators, committee staff and Department of Transportation officials during the annual Board of Directors Washington, D.C. trip in late February. March 31 is looming large, and legislators have a heavy lift to get this bill passed before the current extension of the transportation bill expires. Mobility 21 urges our representatives not to let partisanship hijack the urgently-needed transportation bill, and to stay focused on what matters: job creation for thousands of American workers. Mobility 21 is carefully reviewing the newly-released bill and its fiscal impacts on regions like Southern California. Watch for Action Alerts from Mobility 21 in the coming days as we focus our advocacy on making sure that Congress understands what’s at stake for our country if they fail to pass a transportation bill that keeps goods and people moving. M21: What’s going to happen this year in transportation? 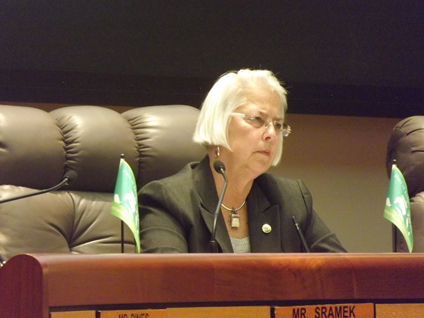 What’s on tap for the Assembly Transportation Committee in the coming months? BL: High-speed rail is a top priority. We really are at a pivotal point. Federal money starts to melt away if we haven’t used it by 2017. That may sound like a long way off, but it’s not. Naturally, I still have questions about the 2012 Draft Business Plan published by the High-Speed Rail Authority. I know the Governor and his advisors are working hard on the program. I hope with a bit more nudging, the Authority can deliver a plan that is cost-effective, stays true to the wishes of the voters, minimizes financial risk to the state, encourages private investment sooner than later, and provides immediate relief to our ever-increasing transportation demands. Beyond high-speed rail, we have got to figure out how we’re going to provide adequate, reliable funding for transportation. We need to seriously address how we maintain and protect our existing infrastructure. It is degrading at an alarming rate. There are several ideas floating around about how we might approach this. I am anxious to learn more about these and would encourage folks to come share their solutions with me. M21: What will be your Committee’s role with high-speed rail this year? What are your views on the project, the new business plan and the peer review committee’s recommendations? BL: As I said, I am a fan of high-speed rail. I want it built. I want to buy a ticket. But my desire to climb aboard is tempered by my determination to proceed in a judicious manner so we can deliver a rail line worthy of the name California. There are legitimate criticisms about the High-Speed Rail Authority’s current approach. So I am hopeful that the word “draft” in Draft Business Plan means we will see significant improvements to the final product. The decision about funding for the project rests first with the legislative budget committees and not my committee, the Assembly Transportation Committee. Naturally, however, my colleagues and I work closely together on this and other issues and we will no doubt be a part of that decision-making process. Beyond that, of course, there will be ample opportunity to guide, direct, and oversee policies affecting the project for years to come. These discussions will generally be within the purview of my committee. M21: As California’s economy looks to rebound, what policies are you preparing to address this year that can increase the number of jobs created by transportation projects? BL: We must find ways to move projects forward and put people to work. I will be meeting with industry representatives, state and regional transportation officials, and other stakeholders about what we need to do to pry open the floodgates and allow these projects to move forward. I am particularly interested in looking at the broadest array of financing options available for our infrastructure. We have made some strides in this regard but I think we need to intensify our efforts. M21: Having chaired the Assembly Transportation Committee for almost two years now, what are the top three things you want Californians to know about their state’s transportation system? BL: First, I sincerely believe we have immense, as yet untapped potential in our transportation resources. We have high-caliber people in the transportation industry—from transportation officials, contractors, engineers, planners, manufacturers and operators. What I mean is, we do have the brain power to make a lot of progress. Second, I believe transportation is one of the single-most important services government can provide to its citizens. Imagine a California without roads, highways or bridges. It’s absurd. Maintaining and improving our system is a challenge that absolutely must be met. One of the reasons I love being the chair of the Assembly Transportation Committee is because I believe the work we do has a direct and often profound impact on our quality of life and, consequently, it is very rewarding work. Third, it belongs to the people. It’s your system. You pay for it, you rely on it, you demand changes and improvements, and you have every right to. Don’t let anybody kid you. This gigantic transportation system belongs lock, stock and barrel to the people of California. M21: How can we best move forward on critical goods movement improvements that will maintain and create good jobs – like the 710 truck lanes – with limited financial resources and challenging environmental and community approval processes? BL: This is a tough challenge but I think the answer is really quite simple: we need to design and present solutions that make sense and, ultimately, will win the day based on the merits of the solution. Take for example our self-help counties. Even some of California’s most tax-adverse counties have successfully passed sales tax measures for transportation. In fact, 85 percent of Californians live in counties with sales tax measures for transportation. Why have self-help counties been so successful at a time when the anti-tax sentiment generally is so high? I believe the answer is because the sales tax measures include expenditure plans. People have demonstrated over and over their willingness to be taxed when they know specifically what they are being taxed for and can weigh the cost of that tax against the burden of not having the transportation improvement. Resoundingly, voters have supported the sales tax. Similarly, we need to build good cases supporting the solutions we present and we need to give folks the opportunity to decide whether the cost of the solution is worth it. M21: The approval of local transportation sales tax measures in California shows that people will support higher taxes for transportation if they are assured that they will benefit in the form of better roads and transit in their area. How can this model be used going forward? Can this be achieved at the state level? BL: This is something I’ve been mulling about for some time. Again, I think the key to implementing this model on the statewide level is in the expenditure plan. I’m not yet sure how to implement such a plan at the state level but I think that this is ultimately where we need to head. And, of course, once we set forth such a plan, we have to be accountable to the voters to deliver it. M21: A lot of discussion lately has focused on how we will pay for the transportation system moving forward. What are your thoughts on this? Who should pay and how much? BL: I think there a couple of possible answers to this question. First, as I mentioned earlier, transportation is one the most important services government can provide. There is a sort of baseline benefit that we all derive from have a working transportation system—such as, delivery of goods, access to services, and personal mobility. Consequently, we should all contribute to the basic provision of transportation at some level. Beyond this basic level of service, perhaps we should begin to think of transportation as a commodity and market it accordingly. A good example of this is high-occupancy toll roads (HOT). Not everybody uses HOT lanes all the time; however, there are times when getting somewhere more quickly is more than worth the cost of tolls. And we’re going to have to think of a replacement for the gas tax. As more vehicles travel farther and farther on less and less gas, we’re going to need a steadier source of revenue. That’s why last year I urged federal transportation officials to take a look at taxing miles traveled rather than fuel purchased. It’s in the early stages. It needs study. Of course, this represents a huge paradigm shift and implementing it might scare a lot of people. Nonetheless, I think it would behoove us to begin thinking of our systems as such and setting our revenue structures accordingly. With approval from the Transportation Corridor Agency (TCA) Board of Directors in late 2011 to extend the SR-241 toll road in segments, TCA staff continued analysis to determine the terminus location of the first four-mile extension. The first segment will extend to an interim terminus at Cow Camp Road, a major east-west arterial roadway planned in the San Juan Capistrano area. When the adjacent local transportation system is complete in the unincorporated area north of Ortega Highway and east of Antonio Parkway, a permanent SR-241 interchange will be built at future G Street. The engineering, environmental, traffic and financial analysis is scheduled to be complete in October 2012 and construction could begin shortly thereafter. One of the design features included in the $200 million 4.8-mile project is the construction of three wildlife crossings to protect wildlife movement through the area. The governor’s proposed budget for FY 2012-13 forecasts a $9.2 billion shortfall, a sharp drop from the $27 billion deficit the legislature faced last year. Going forward, the budget forecasts a structural shortfall of $5 billion, down from $20 billion a year ago. 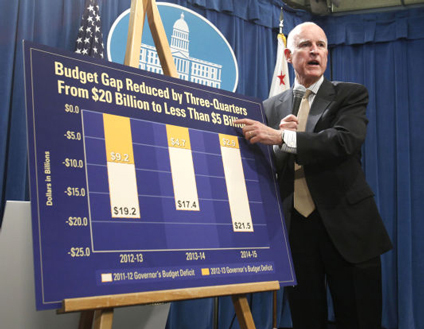 Released earlier this year, Governor Jerry Brown’s FY 2012-13 budget proposes several changes to the structure of transportation planning at the state level, provides funding continuity during late budgets and continues the Proposition 1B program. One measure proposed by the governor is the transfer of non-transportation departments in the Business, Transportation & Housing Agency to other existing agencies, while creating a Transportation Agency. The new agency would include Caltrans, DMV, CHP, the Board of Pilot Commissioners and the California High-Speed Rail Authority. 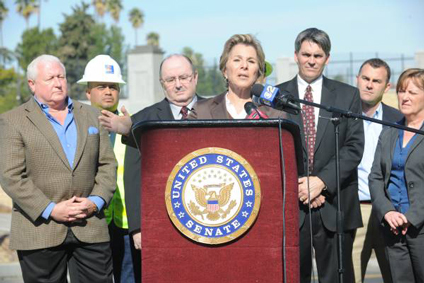 Sen. Barbara Boxer paid a visit to Riverside’s Magnolia Avenue Grade Separation Project during a press conference to call on Congress to pass a long-term transportation bill to create jobs and get the economy moving. Boxer urged Congress to focus on projects like the Magnolia underpass to help keep freight moving quickly without adding delays to commuters. Once complete, the Magnolia Avenue Grade Separation Project will separate train traffic from the roadway and increase safety, reduce congestion and create more than 500 local jobs. Over two hundred transportation leaders and industry professionals gathered in Sacramento last week for the annual California Transportation Foundation (CTF) conference. Mobility 21 Board Members Anne Mayer and Lucy Dunn also gave presentations at the conference. Mayer, Riverside County Transportation Commission Executive Director, shared her insights on public-private partnerships from the local agency perspective. While not every project is a good candidate for this project delivery method, Mayer expressed the importance of protecting public-private partnerships as a viable option to building transportation projects. Dunn, Orange County Business Council’s President and CEO, discussed the Southern California Association of Governments’ Regional Transportation Plan (RTP). Dunn explained the need for an RTP and Sustainable Communities Strategy to keep up with California’s growing population. 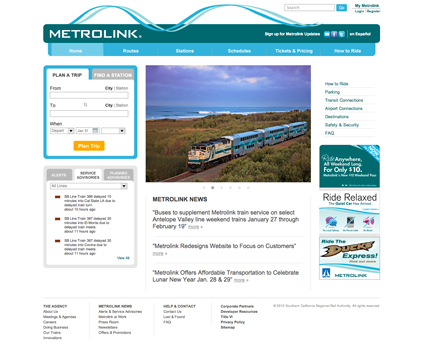 Metrolink recently launched its newly designed website, which features a fresh new look and feel and a host of new features. The site’s homepage now welcomes visitors with a clean, uncluttered design that is focused on the Metrolink riders’ needs with easier access to improved travel planning tools. In redesigning the website, the focus was to create a site easy to use for a new rider unfamiliar with the Metrolink system. The new train schedule page offers schedule information by line, by station, station to station and downloadable timetables in pdf format. The new “My Metrolink” section allows visitors to create a personal account to customize their experiences, subscribe to e-newsletters, set preferences for favorite station pairs and track lost items. 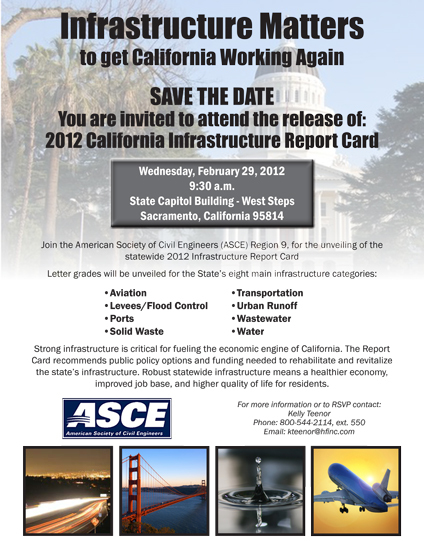 Mark your calendars for the release of the American Society of Civil Engineers (ASCE) 2012 Infrastructure Report Card. Next Post	Southern California’s Mobility 21 Fights for Transportation, Jobs in Washington, D.C.